Something bizarre happened overnight: New York City's population grew to the size of Shanghai's, swelling from 8 million people to 24 million. It's like a natural disaster, but this tidal surge is made of human needs. Here's how we'll rebuild the city to make room for them all. Though the rapid change is fantastical, the transformation isn't: New York's population is likely to grow by almost this much by the end of the century. All over the world, cities are making the transition from large cities to megacities of over 15 million people. So our thought experiment isn't about wanting to escape to the city planet Coruscant from Star Wars. It offers a glimpse of what the largest city in North America might actually look like in 2114. New York City is already one of the most densely-packed urban spaces in the world, with 10,724 people on average per square kilometer. To triple the living spaces here, we'll need to build up — but we'll also need to build between. The city could no longer afford to devote so much street space to the products of an already-shaky auto industry, and the city's grid would change immeasurably. So would the laws that govern it. For efficiency's sake, Manhattan would have to retain a couple of the major avenues like Fifth, which cuts through the center of the island. But it would be reserved for trucks delivering food — or taking garbage out. Other streets would be for licensed taxis and services like Uber, while cars belonging to individuals might be routed to the edges of island, or to other boroughs entirely. Getting around in Manhattan would mean taking public transit, or paying dearly to get an Uber. At the same time, there would be a flowering of pedestrian walkways like Sixth and a Half Avenue, which tunnels through the skyscrapers of midtown in between Sixth and Seventh Aves. As more skyscrapers grew, walkways would also take to the skies in bridges between buildings. To keep the ground-level streets less congested, pedestrians would be invited to walk Broadway from the air, hustling from building to building via a growing network of architectural tissues that would nourish a new sidewalk culture fifteen stories off the ground. 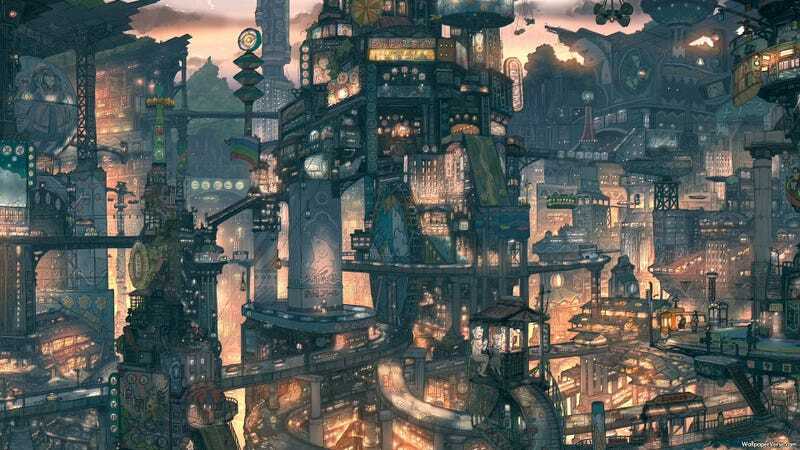 A world of Judge Dredd-like megastructures, land bridges across rivers, and pedestrianized super-corridors extending through the labyrinthine hearts of financial complexes ... carving new routes through the deep interiors of buildings, without a car in sight. It would no longer be enough to tell someone to meet you at the deli on the corner of 55th St. and Seventh Ave. You'd have to give a three-dimensional destination, specifying whether this would be the corner on the 7th story or the 15th. If we want to keep our population of 24 million inside the current metropolitan area, however, we're looking at an absolute catastrophe. Shanghai's density is roughly 3,809 people per square kilometer, so it may have a huge population but it also occupies an enormous land area. If we crank up New York's current density to three times its current state, the only cities we can compare it to are ones like Dhaka, in Bangladesh, which are riddled with shantytowns. City planner and architect Mark Hogan says that even if we were willing to house New York's additional population outside the city limits, it would still take up 10% of Connecticut's current land area at its current density. So we're going to have to build New York out, way out, after we've stretched the outer boroughs to the breaking point. The city's tentacles would reach out along transit corridors that already exist. As you can see in the map of "Boswash" above, there is already an enormous amount of urban density along the Northwest Corridor train line that connects Boston to Washington, DC. Now, imagine 16 million more people in that fat ribbon of urban development. Columbia professor of urban development Kate Ascher (author of The Works) thinks the megacity of New York would have to spread into transit corridors, with construction booming (and prices skyrocketing) near train stations that can take commuters into the city center. Many of these new nodes would also be high-density areas with little area for automobiles and elevated sidewalks shuttling commuters through their vertical towers. If it happened overnight, I think it would be a disaster. I think you would end up with millions living in third-world conditions. A better solution would be to distribute the extra population over the Northeast Corridor, so less dense places like Philadelphia and Connecticut can help pick up the growth. Lower-rise housing could be built at high densities throughout the corridor so you end up with a huge Paris instead of another Dhaka or Kolkata. What would we call this new megapolis? Would it remain New York City, or would it become Boswash, or New Conndelphia? If we look to China for inspiration, we already have one possible answer. The nation has just designated a new urban zone called a "city cluster" in the Pearl River Delta. That region is already home to a handful of enormous cities, including Shenzhen (pop. 10.3 million) and Guangzhou (pop. 12.7 million). The plan to make one economic center out of the Delta involves linking the city clusters to each other with high-speed rail and putting money into development for less affluent cities. Even if we can create our own version of Pearl River Delta's city clusters along the eastern seaboard, we may still be looking at an urban disaster. New York City produces about 37,000 tons of waste per day, all of which has to be trucked out of the city, often for hundreds of miles, before finding its final resting stop in landfill. Certainly the city might begin recycling more if the population boomed, but we'd still be looking at about three times the amount of waste — so, we can assume that our 24 million New Yorkers will be pumping out 111,000 tons of garbage every day. The problem wouldn't be the garbage piles, but the infrastructure needed to move them around. So says Robin Nagle, author of Picking Up, and the anthropologist-in-residence for the New York City Department of Sanitation. Nagle says that we'd notice a lot of small differences as the city grew. First of all, garbage trucks would have to be bigger. Even the street sweepers known as mechanical brooms would have to change. Currently they scour the streets, swirling up everything from used needles to Blue Bottle coffee cups, depositing them into a hopper that holds roughly a ton of litter. In the New York megacity, we'd need much bigger hoppers, bigger garbage trucks, and a veritable army of sanitation workers to run them. A lot New York's remaining major streets would be filled with garbage trucks. Ultimately those trucks might be the biggest problem. Hauling garbage to distant "final deposition" sites would stress highway infrastructure and air quality, along with landfill capacities. In our efforts to rid the city of garbage, we'd just be creating an even bigger pollution problem. It's an ugly scenario. To find a new home for the landfill, the the city might rejuvenate a 1934 plan for expansion, which would have topped up the Hudson River with landfill. At the same time, the city might also explore radical new methods for garbage disposal, including converting it into an energy source or biochar for fertilizer . The edges of the city might be ringed with enormous biochar plants that heat up all the waste until it's converted into a coal-like substance whose byproducts include carbon neutral fuels. Most of New York's food arrives the same way garbage escapes: on trucks. There's been a lot of excitement about building vertical farms within Manhattan, or skyscraper greenhouses packed with enough crops to feed the whole city. But there is a lot of controversy over whether such structures would save money and energy. In the more populated future, we're probably looking at bringing in food on trucks powered by alterantive fuels rather than giant hydroponic farms towering over Union Square. With so many people depending on imported food, however, food security expert Evan Fraser worries that the new megacity would be even less prepared for disasters than it is now. Where would the city store emergency food supplies for 24 million New Yorkers if a natural disaster were to take down the power grid or blanket the midwest in ash? "New York City is dependent on a global supply chain for its food," Fraser said. "We have no data on what kinds of food stores exist because the government doesn't store food anymore. And food companies like Walmart or Monsanto won't tell us what they have stored. It's a proprietary secret." A volcanic eruption or war that affects the food supply chain could wreak havoc in this dense city whose people generally worry more about their proximity to transit than their access to grain. Short of this kind of disaster, though, New Yorkers will probably maintain their current food obsessions. The hyper-populated city might devote itself to the social aspects of dining even more than it already does. New high rises will offer micro-apartments without kitchens. Instead of cooking at home, residents have access to a communal kitchen area for cooking on each floor — or they can go to a group dining floor to buy dinner from the co-op chef. Robert Hammond, one of the founders of New York's High Line Park, believes that novel communal spaces like these are bound to emerge in a city whose sheer size creates a feeling of loneliness. Repurposing an old railway bridge to create a park has convinced him that our several million new residents will need to reuse old industrial spaces as well as build new ones. Those enormous kitchens that New Yorkers never use could finally become useful living spaces. And who knows? Maybe we'll build parks in the husks of abandoned parking structures, and some of our new aerial sidewalks will be lush with greenery. Unlike many cities that are struggling under the weight of population expansions, New York has one precious resource in abundance. Partly due to smart early planning, and partly due to luck of geography, the city has many sources of drinking water, including the Catskills and Croton watersheds north of the city. Clean water from these areas tumbles into the city through viaducts, propelled by nothing more than gravity. Even if the city were to swell to three times its size, says civil engineer and water systems expert David Sedlak, the city's residents wouldn't be parched. The real question is how New Yorkers will start to recycle the water they have. Turns out the answer could help a little bit with the waste problems that our garbage-producing millions are creating. New York City has what's called a combined sewer system, which means that sewage uses the same pipes as water runoff. You can imagine what happens when this system is flooded with storm water. If you've ever smelled something terrible in New York during a rainstorm, now you know why. This problem is only going to get worse as the amount of sewage increases. But Sedlak points out that water recycling plants pull straight from the runoff system, converting our flood of contaminated water into drinkable water — thus preserving our watersheds and helping to deal with excess waste. The city might begin refilling the Croton watershed as it empties out. Instead of just spurting out toxins and garbage, the city could produce its own fuel and fresh water. When New York City sprawls all the way from Boston to Washington, DC, its urban clusters linked by high speed rail, it's far from certain that the megapolis will be sustainable. Realistically, there will be pockets of sustainability right alongside regions where people continue to drive hundreds of miles to dump their garbage. Connecticut might grow its own version of Dhaka, with shantytowns that are barely wired for electricity. And Manhattan might isolate itself behind a wall, allowing in only the people who can afford the exorbitant tolls — and who register as clean on the identity detectors flanking the entrance to every elevated walkway system. The city once known as New York will be in crisis, its citizens divided over how to maintain over 16 million new immigrants and residents. This kind of crisis has defined city life for centuries, if not millennia. As urban populations swell, bizarre new problems arise. Neighborhoods and communal spaces are redefined, and privacy sublimates into something else. We can use raw numbers and urban plans to understand what our future cities might look like, but there are always unpredictable outcomes. What will mega New York's economy be like? Will it have a single municipal government, or a coalition of representatives from city clusters? Just as important as these questions, though, are more pedestrian ones. You have to imagine what it will feel like to eat dinner every night with the random people who live in your building. Maybe they are the ones who will help you when the next tidal wave leaves the shelves at Whole Foods bare. Or maybe they'll just pass you by on the elevated sidewalk without a second glance, before disappearing into the crowds. Annalee Newitz is the editor-in-chief of io9. She's the author of Scatter, Adapt and Remember: How Humans Will Survive a Mass Extinction. Follow her on Twitter, or email her.